Hmmm, I am still unsure if I have made a mistake in naming of this famous Taiwanese cuisine. 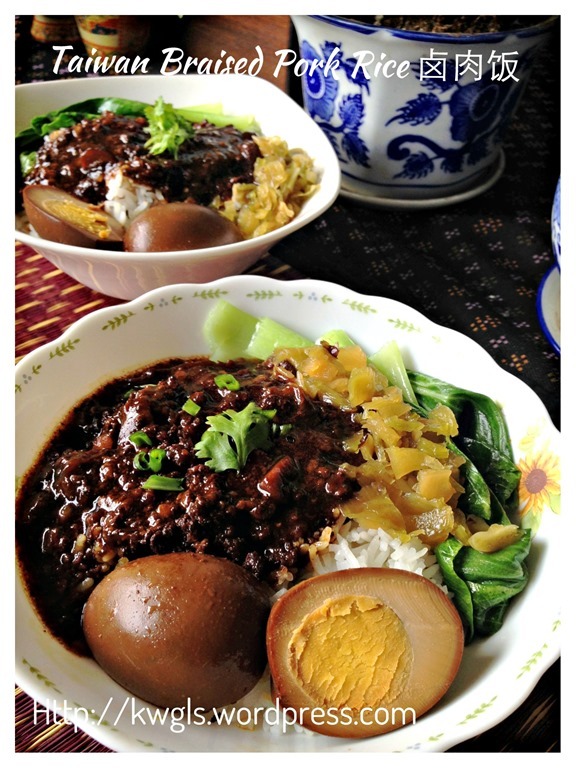 Though in English both were called Lu Rou Fan but one in 卤肉饭 which is prepared by braising big pieces of meat and the other one is called 鲁肉饭 which is basically prepared by braising minced meat. However, the method of preparation appeared to be the same. Wiki (as below) mentioned that the word “鲁“ and “卤” had been used interchangeably for many historic years. 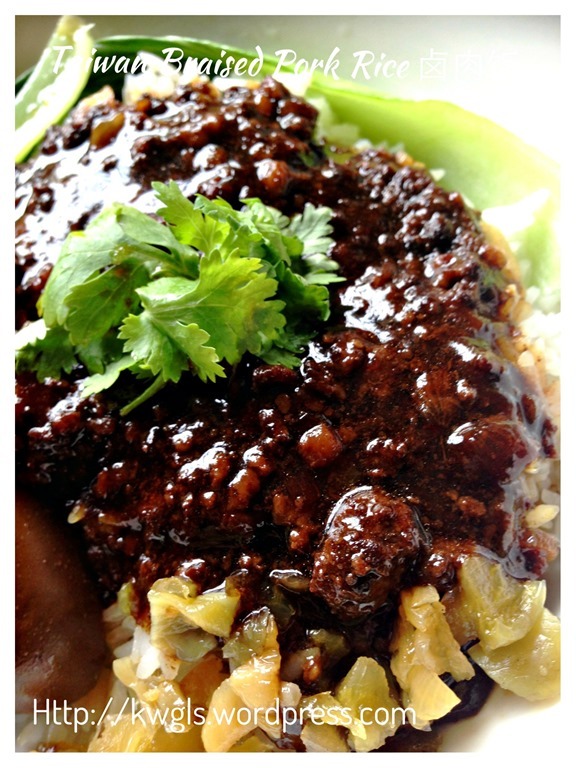 Lu Rou Fan is one item that I never miss ordering if I frequented Taiwanese restaurant. I loved that type of sweet, melt in the mouth texture of meat, full of dark soya sauce， fried shallots and mushroom aroma. My wife have requested me to try preparing this after her recent trip back from Taiwan. She said that she love this hawker snack especially in the famous Shi Lin night market. “Minced pork rice (Chinese: 滷肉飯; pinyin: lǔ ròu fàn; Pe̍h-ōe-jī: ló͘-bah-pn̄g) is a Chinese-style donburi (rice covered in sauce) commonly seen throughout Taiwan and southern Fujian province. 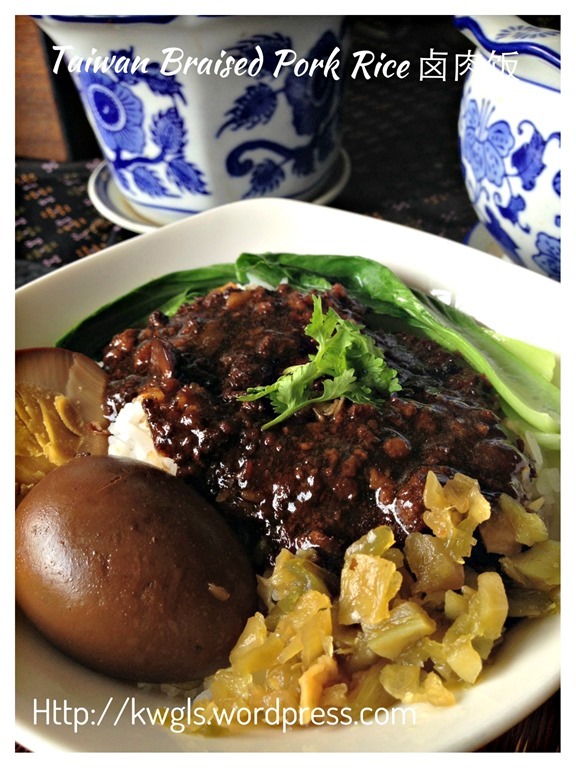 The flavour may vary from one region to another, but the basic ingredients remain the same: ground pork marinated and boiled in soy sauce served on top of steamed rice. 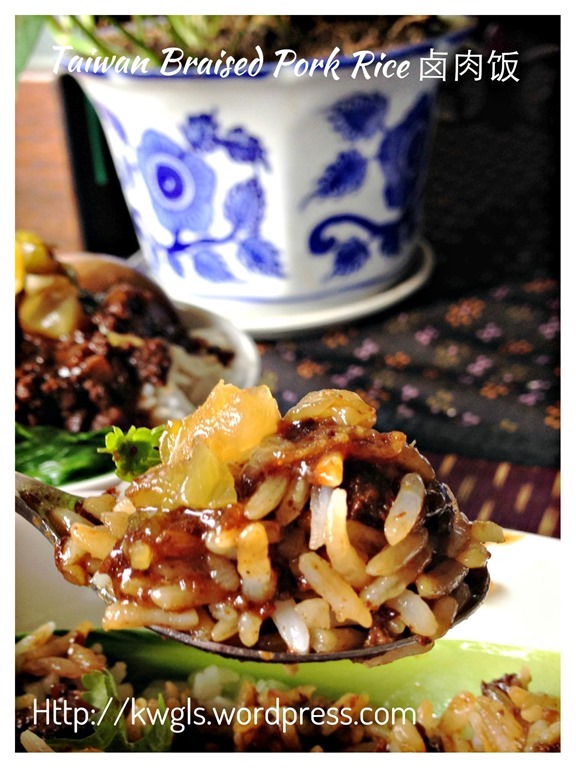 The word “Lu (滷)” has the closest meaning to “cooking in thick broth or sauce.” This gives the term “滷肉飯” the direct meaning of “rice with braised meat. However, for several decades, Taiwanese have used the homophone “魯” instead of “滷”. Although people still use the original character in China, “魯肉飯” has become the most common name seen in Taiwanese restaurants and street vendors. I have used slow cooker to braise the meat overnight. But that is not necessary. You can always braised the meat over the stoves for 3-4 hours or until the meat are soft. 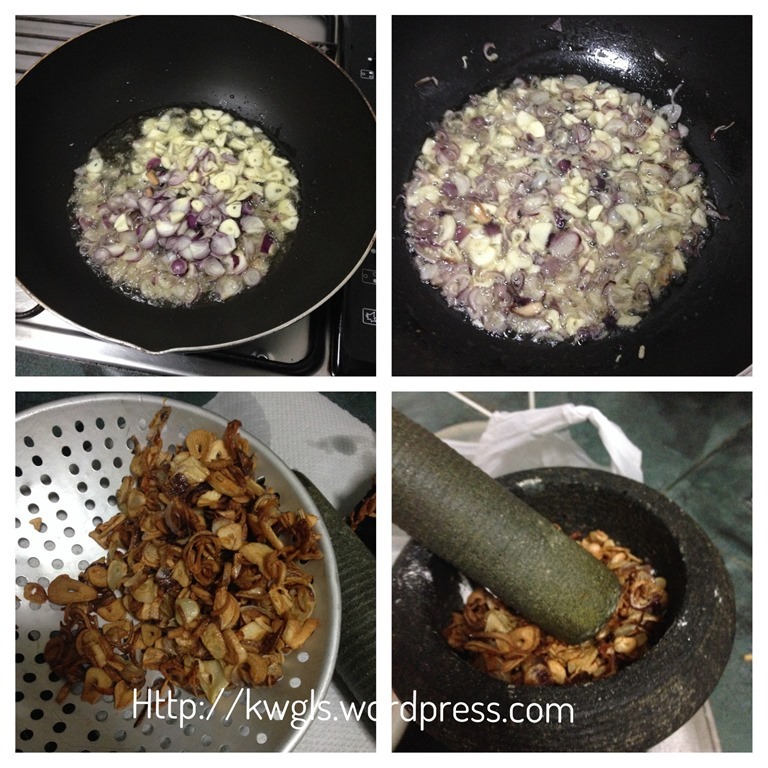 Have some cooking oil adequate to sauté the garlics and shallots slices. Sauté the garlic and shallots until it is golden brown, crispy and fragrant. Drain and use something to “break” the fried shallots and garlics. Set aside for the later use. Use the same frying pan, transfer out some of the oil and leave about 2-3 tablespoons of oil in the frying pan. Sauté the sliced mushrooms until aromatic. 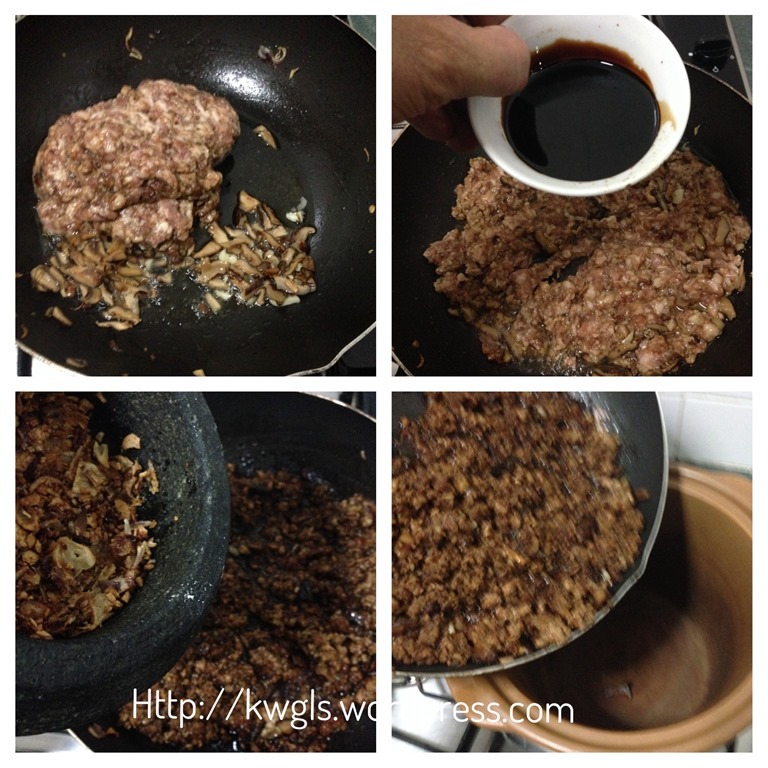 Once ready, add the minced meat and dark soya sauce. Stir fry until well combined and colour is evenly distributed (about 2-3 minutes). 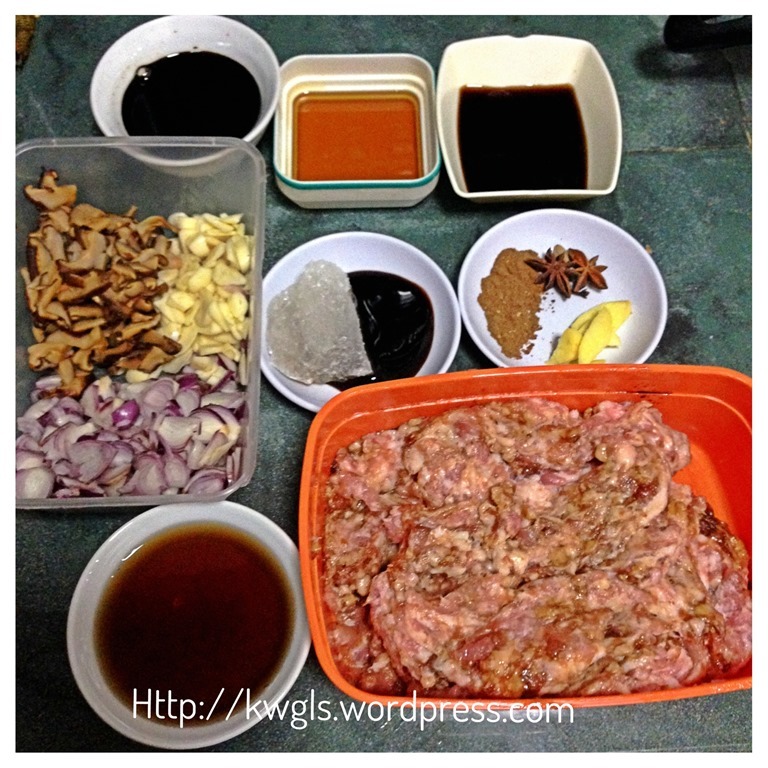 Add the minced shallots and garlics and transfer the half cooked minced pork to the slow cooker. In the slow cooker, add cooking wine, light soya sauce, sesame oil, cinnamon stick, oyster sauce, star anise, rock sugar, five spice powder and ginger. Use something to stir all the ingredients until well mixed. Add plain water adequate to cover the minced meat. Cook in the slow cooker for 4-5 hours. 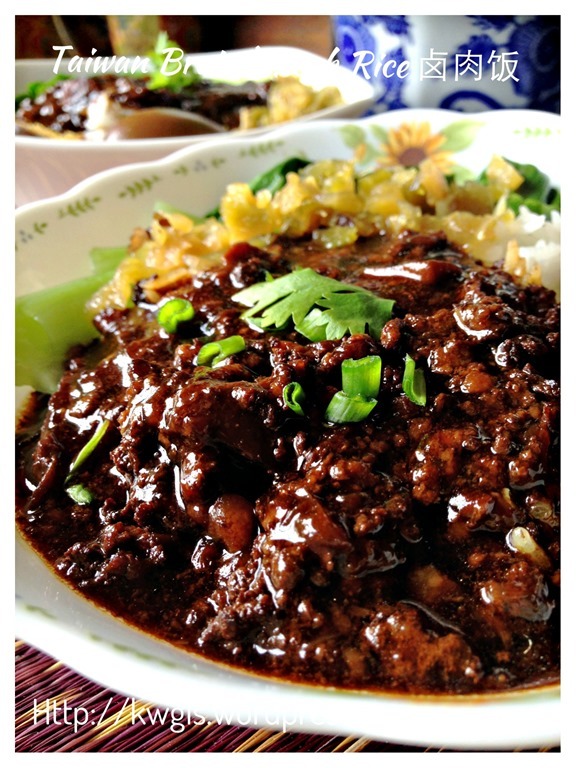 If you do not have the slow cooker, simmer the above ingredients over low heat on a stove for 4-5 hours. If you are cooking braised eggs, you can put the hard boiled eggs about 2 hours before the completion time. Depending on your preference, you can add starches to the braised meat to thicken the soup and smoothen the meat texture. If you plan to do that, dilute 2 tablespoons of corn flour with 2 tablespoons of water. 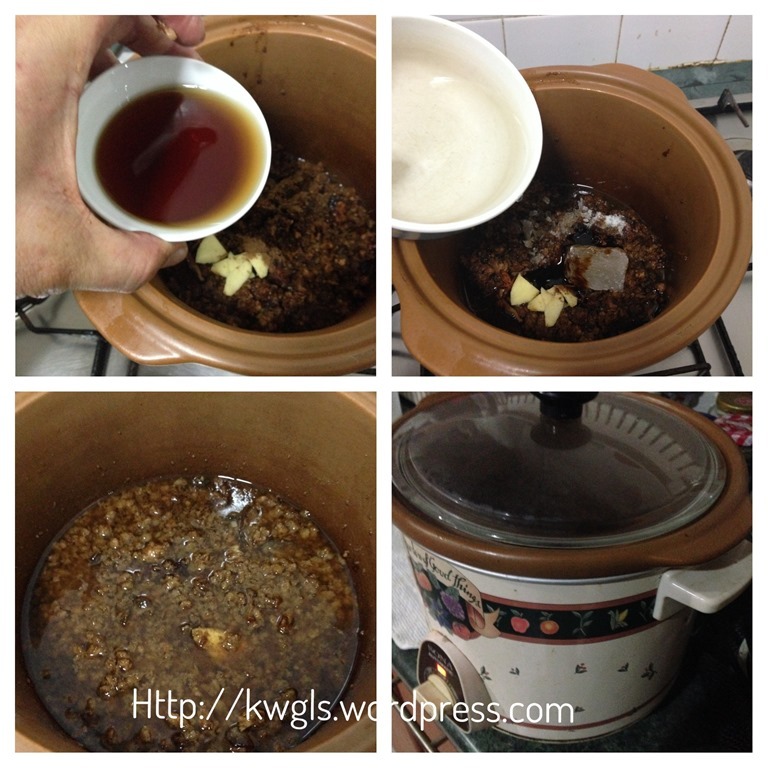 Add the starch solution to the braised meat gravy gradually. Cook until the gravy turned transparent. 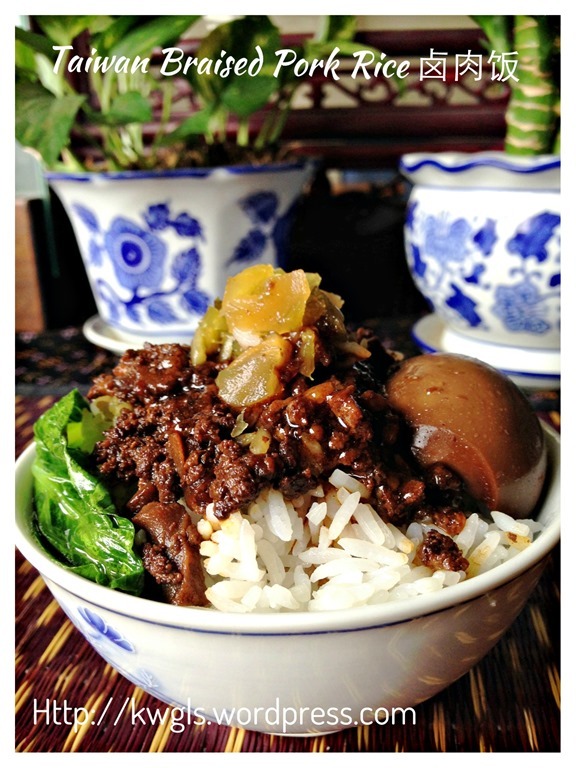 For assembly, have a bowl of rice, put some blanched green vegetables, some braised eggs and some minced pork on top of the hot rice. Add some Daikon or preserved vegetables to ease the greasiness of the dish. However, that is totally optional. 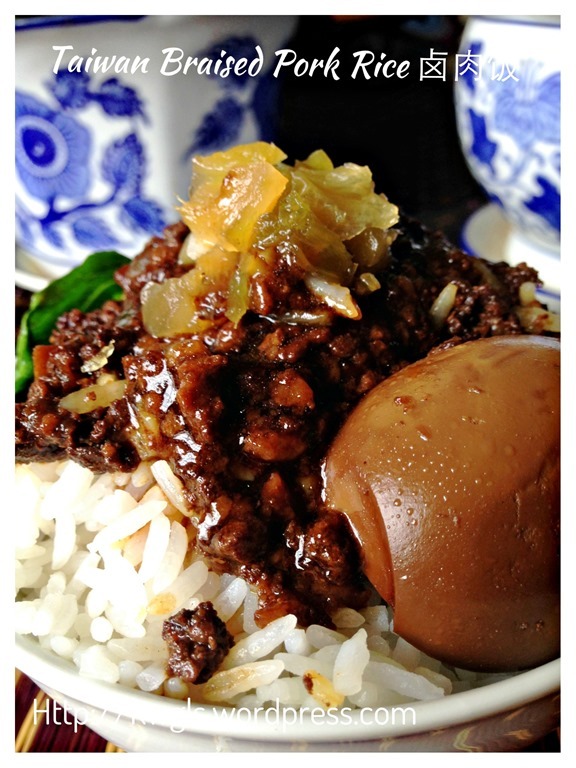 I have used 贡菜 (a type of preserved mustard) and it definitely goes well with the minced pork. 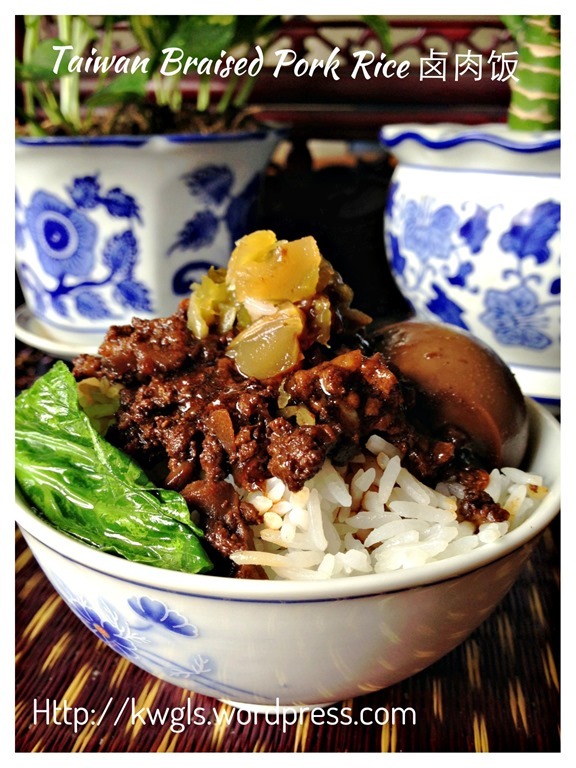 Best served as a complete one pot rice dish. 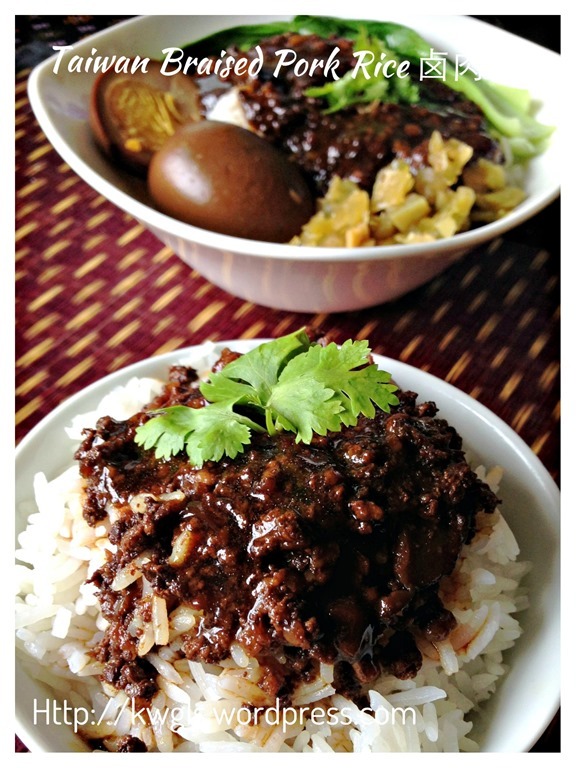 This is a savoury dish and you should try to tailor to suit your family’s taste buds. It is supposed to be slightly sweet, salty, aromatic and a bit greasy. But with the Daikon or other preserved vegetables, the greasiness is negated by the refreshing preserved vegetables. 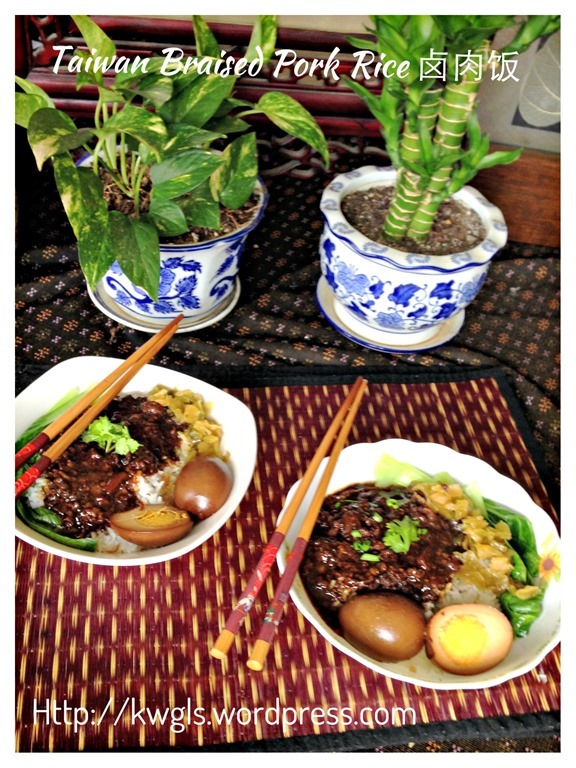 I am happy with this adventure and i hope all of you can give this recipe a try. 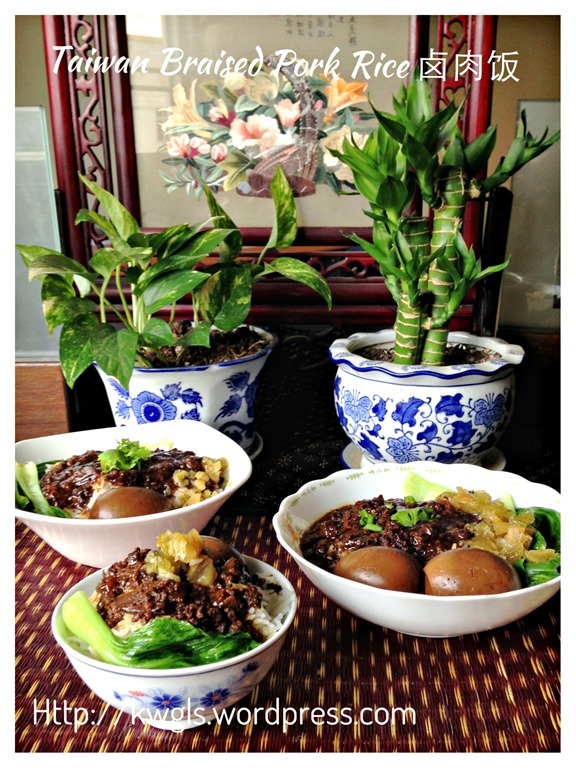 This entry was posted in Dish, Food Preparation Series, Meat Dishes, Noodles, Rice and Others and tagged 8, Braised Minced Pork Rice, 肉燥饭, 鲁肉饭, GUAI SHU SHU, Guaishushu, kenneth goh, Lu Rou Fan, postaday, 卤肉饭. Bookmark the permalink. 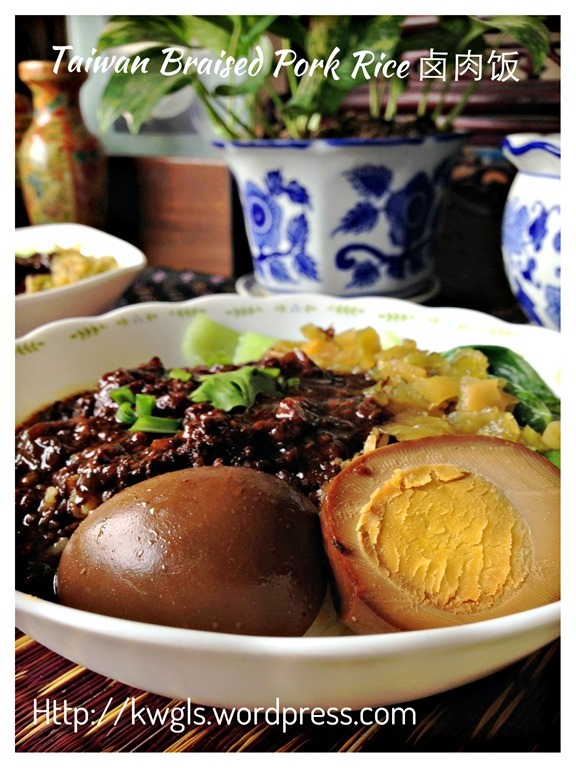 Hi I am a new follower, can you guide me on how to find recipe on braised egg? Or any other recipe that you have posted previously? Thank you. Braising the mince meat for a few hrs will it become tough? I’m asking because when I steam my mince meat longer it become tough so I’m wondering whether which portion of the meat u using? I usually get the pre-pack mince meat from the supermarket. I tried your recipe today.Perhaps I should have read the comments before doing it as I used pre packed minced meat instead of using pork belly and minced it myself. I haven’t eaten it yet though I packed for my husband for his dinner. Hope you like it. At times I used pre-packed minced meat too. Should not have a huge difference. Hi Kenneth. Firstly thank you for the recipe. Do you have the recipe to make the salted vegetable as shown in the photo? 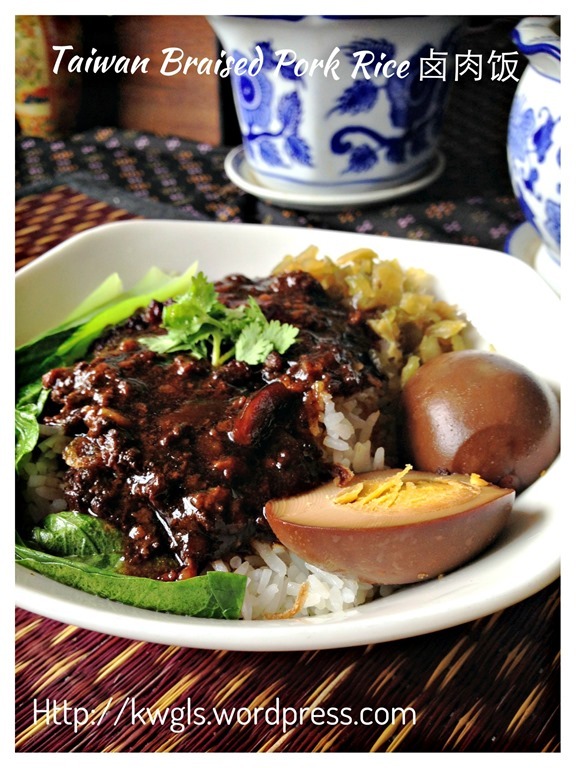 I love this with porridge and Bak Kut Teh. Thank you in advance for your kind reply. 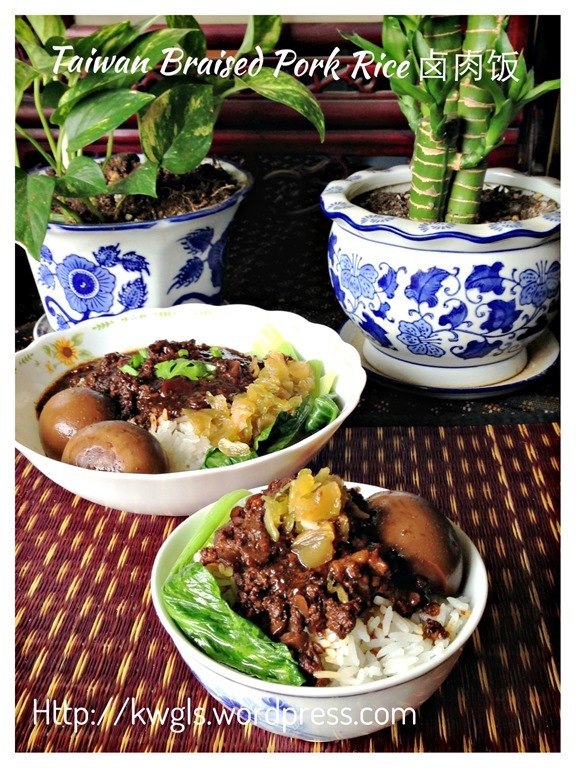 If I use packed ground pork, will the taste be completely different? And how will that affect the time of cooking, when it comes to simmering it at the very end? Thanks!! Hi, thanks for the recipe! For the dark soya sauce, is salty kind or sweet kind? Half cup means how much? Those rice cup, half cup? Or use baking cup? Tks! !